Antique Cairene Rugs – Under the Ottoman Turkish Empire in the sixteenth century, a new style of carpet production emerged in Cairo, Egypt under carefully controlled court patronage. 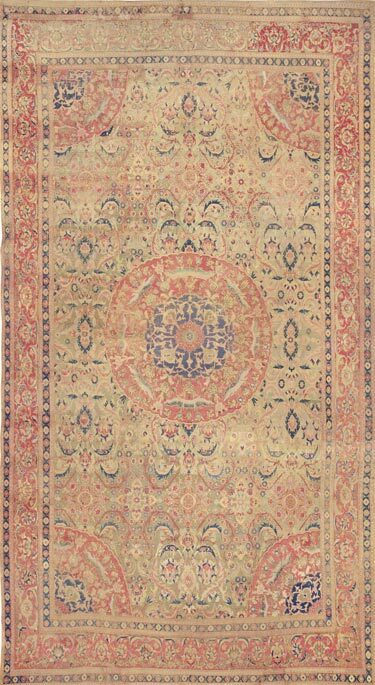 Closely related to classical Persian carpets, such antique carpets of Cairene origin display sinuous curvilinear designs of arabesque vine scrolls and palmettes organized in a medallion format. The coloration of antique Cairene rugs tends to be subdued in tone and range, allowing attention to focus on the grace and delicacy of the details. Indeed, it is the precise weaving of the detail elements that elevates the Cairene style to such heights. Egypt was not historically a center for rug production, although beautiful textiles have been produced there since at least the third millennium BCE. However, when the Mamluks rose to power, the arts flourished and exquisite carpets, glass and metalwork were made under their rule. Now these antique rugs are prized for their beauty and rich history. Mamluk means “to own.” The Mamluks were Turkish slaves who served under Arab Muslim rulers. Mamluks were trained, converted to Islam and freed, serving in prominent military and political roles. Over time, they gained much power, eventually overthrowing the Ayyubids in 1250 and establishing the Mamluk Sultanate. They were fierce warriors who repelled the Mongols and defeated the Crusaders. They were eventually conquered by the Ottomans in 1517 in Egypt. Antique Cairene Rugs – Carpets from Egypt are among the most enigmatic and interesting within the broad spectrum of oriental rugs. Their stylistic evolution reflects the turbulence of historical events and conflicts of dynasties throughout the history of the Middle East. The carpets produced by Mamluks do not have a known precedent. After the demise of the Mamluks, the tradition died. When the Ottomans rose to power, some of the technical characteristics were continued in the production of Egyptian carpets, but the essence of the motifs changed. It is not known where the carpets were woven, although scholars assume that production was in Cairo under court patronage. Mamluk carpets are rare; many of those in existence today are housed in museums throughout the world. Others are in private collections. 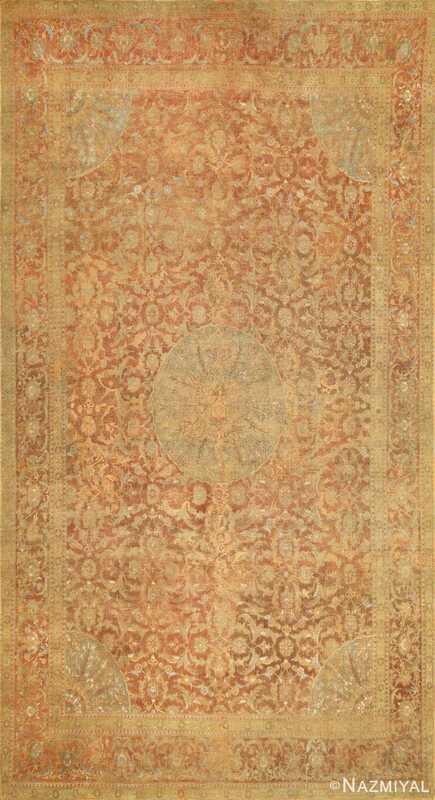 Several unique attributes characterize Mamluk carpets. The palette is usually limited to three colors: saturated reds, blues and greens. Some carpets use four, five and six colors that include the basic three plus white, brown and yellow. The origin of the dyes is unknown. Some scholars attribute the red to lac from India, but this has not been substantiated. Color is also used in the warp and weft threads. Warps, in sets of four, are dyed green, creating a striped effect. Wefts are often pink or red, using two or three threads per row. The wool is lustrous; when combined with the depth and quality of the colors, a shimmering, jeweled effect is created. The origin of the wool is not known; it does not come from sources near Cairo. The designs are geometric, precisely woven because of the regularity of knotting. The asymmetrical or Persian knot is used. Knot count is within the range of 100-130 knots per inch, with the same number of knots woven both vertically and horizontally. This regularity allows the creation of perfect circles and crisp polygons including eight-pointed stars, overlapping shapes and squares within circles. Mamluks typically feature a square central motif within a rectangle. The motifs reflect designs used in the architecture from this period. Other carpets include several large medallions of geometric shapes. Motifs were repeated and radiate out from the center. Geometric designs contain small, stylized flowers, leaves and other vegetal representations. After the Ottoman conquest of Egypt, Mamluk designs were not produced. Ottoman carpets produced in Egypt, termed “Cairene,” continued to use the asymmetrical knot and color schemes of the Mamluks, but the design elements reflect Persian stylistic rendering. This was a major change in both design and technical execution for the Turkish Ottomans. 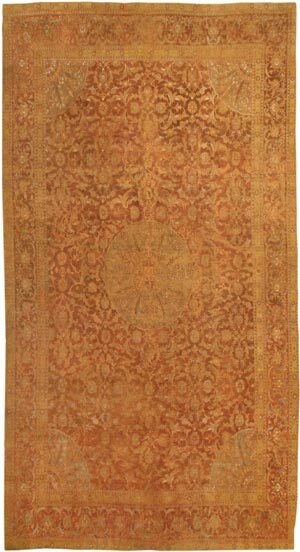 Graceful floral designs, palmettes, leaves and medallions, the sez style, replaced the stylized geometric designs used on Anatolian rugs up to this time. The asymmetrical knot used by the Persians and Mamluks was used to execute these sinuous motifs, rather than the symmetrical knot used in Turkey and many parts of the Caucasus. Many of these carpets are large, court or palace-sized, created for noble patronage. A small group of prayer rugs may have been produced in Cairo during Ottoman rule in the late 1500’s. Although the exact provenance is not known, the stylistic conventions used by the weavers lead some experts to believe these originated in Cairo. Naturalistic floral designs and the traditional mihrab were woven into smaller carpets used as prayer rugs. The inventory of carpets belonging to the Medicis, compiled in 1623, included a Cairene prayer rug. Antique Cairene rugs are some of the most collectible rugs and are found in museums around the world. This magnificent, palatial Oriental carpet from Egypt was made in the Ottoman court workshops of Cairo almost five centuries ago.